Documents How are the audio inputs routed in SigmaStudio's Input cell? For SigmaDSP products that only have digital audio inputs, the routing is quite simple. Each checkbox on the input cell corresponds to one input channel. 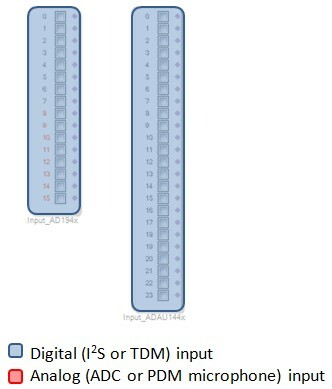 Because TDM modes can be used, the exact mapping between a hardware pin and corresponding input channels will change based on the register configuration. For SigmaDSP products that contain both analog and digital inputs, the analog inputs are represented on the top portion of the input cell and the digital inputs occupy the remaining positions on the input cell. 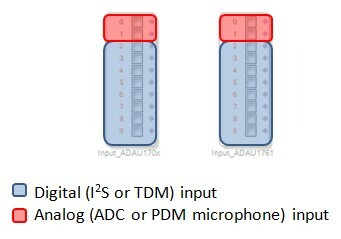 For example, on the ADAU170x and ADAU1761 devices, which have two ADC input channels, the left ADC corresponds to input channel 0, the right ADC corresponds to input channel 1, and the digital I2S/TDM channels correspond to channels 2 through 9 on the input cell.